No paneer? No problem! Make this reduced-fat Indian palak paneer (or saag paneer, really) recipe using ricotta cheese instead of the traditional Indian paneer. 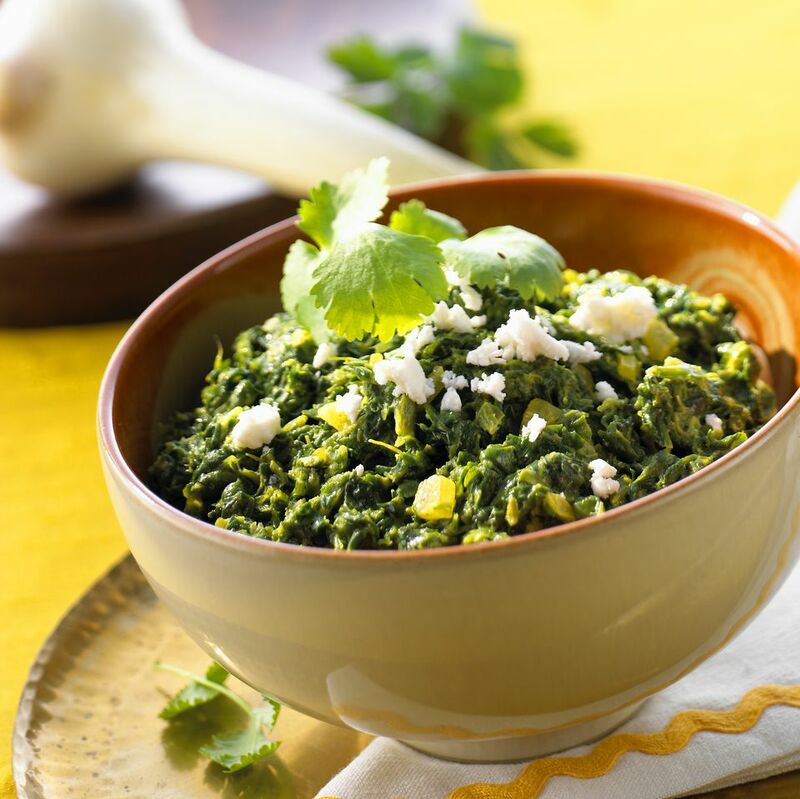 If you don't have a source for paneer in your city, you can still enjoy palak paneer - Indian spinach and cheese. Use a low-fat or reduced-fat ricotta to make this spinach dish. You'll need to use fresh, whole milk ricotta cheese in this recipe, and not the chalky kind that comes in a plastic container. It'll turn out quite differently if you don't! Note that this recipe skips the usual step of pureeing the spinach which most Indian spinach recipes will call for. If you want to puree your greens, just do it before adding in the fried ricotta. Another note: Normally Indian vegetable dishes such as this one would be served alongside a dish of plain steamed white rice, though you could certainly use brown rice or another whole grain. I tend to skip the rice and just eat it on its own. Serve up this fantastic palak paneer with a side of cheese pakoras for a full vegetarian Indian meal. This Indian palak paneer with ricotta recipe is vegetarian and all of the ingredients are gluten-free as well. In a large saucepan over medium heat, sautee the garlic and the onion in 2 tablespoons of olive oil for a minute or two. Add the fresh ginger, cumin, coriander and turmeric, stirring, and allow the spices to cook for another minute. Next, reduce the heat to medium low and add the sour cream, stirring to combine, then the spinach. You may need to add the spinach a little bit at a time, waiting for it to cook down before adding more. Allow the spinach to cook until done, about ten minutes. In a separate skillet, using a spoon, scoop out the fresh ricotta into pre-heated oil one spoonful at a time. Fry the ricotta in 2 tablespoons of olive oil until lightly browned. Add the fried ricotta cheese to the spinach mixture. Cover, and cook on medium low for 5 to 7 more minutes. Add a dash of salt, to taste, and serve hot.